Which of these devices would be considered discrete and which would be considered continuous in terms of their electrical conductivity? What do each of these words mean, and how might they apply to variables in electric circuits other than conductivity? A continuous quantity is one that may be smoothly varied from one extreme value to another, while a discrete quantity is one that can only assume a finite (limited) number of distinct states. Here, the rheostat exhibits a continuously adjustable electrical continuity while the switch is discrete because it can only be conducting or non-conducting. Follow-up question: what is the difference between a continuous voltage versus a discrete voltage? The purpose of this question is to get students thinking in terms of "digital" quantities, which by their very nature are non-continuous. Since most electronics curricula focus on continuous quantities before discrete, it is good to have students reflect on the inherent simplicity of discrete circuitry and components after having studied continuous (analog) circuitry. 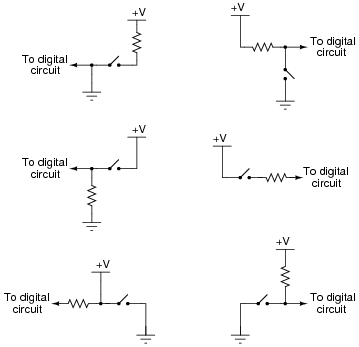 Digital logic circuitry makes use of discrete voltage levels: each "logic gate" sub-circuit inputs and outputs voltages that are either considered "high" or "low". Define what both of these terms means in a digital logic circuit powered by 5 volts DC. "High" = (nearly) 5 volts between the gate input/output and ground. "Low" = (nearly) 0 volts between the gate input/output and ground. This is a very simple concept, but worthwhile to cover in its own question just to be sure no students misunderstand when the concept is later applied. Follow-up question: show how you would calculate reasonable values for the two resistors in this circuit. This question applies the concepts of "high" and "low" voltage signals to a simple transistor circuit, reviewing transistor operation in the process. In the "High" position, the switch directly connects the signal line to +V, ensuring a high logic state; in the "Low" position, the switch directly connects the signal line to ground, ensuring a low logic state. What could be simpler? Explain what functions the pulldown and pullup resistors serve, and also why they are referred to by those names. 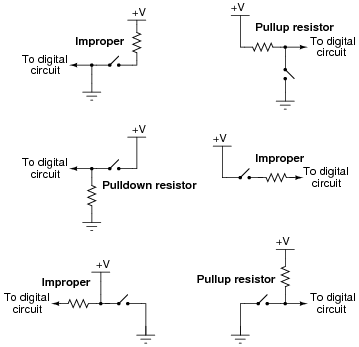 The "pulldown" and "pullup" resistors do exactly what their names imply: they pull the logic state of the wire in the direction opposite what the switch does when closed. Challenge question: how does one calculate the proper resistance (in ohms) for a pulldown or pullup resistor? Will any size work, or is there such a thing as too large or too small? If students do not understand the purpose of these resistors after reading the question and researching their texts, they should when they see the follow-up question. Discuss this question with your students, for the concept of pulldown and pullup resistors is one that confuses some students. Follow-up question: specifically identify what would be wrong with each of the ïmproper" circuits. This is one concept I have found many students have difficulty grasping, essentially because it involves the determination of a voltage drop between two points (the ärrow" wire and ground). It is a spatial-relations problem, similar to Kirchhoff's Voltage Law problems where students need to figure out how much voltage is between two specified points given voltage drops across several other pairs of points. Spend time with your students discussing these circuits, because several of your students will probably not understand this concept the first, second, or even third time through. I strongly recommend students take the approach of a "thought experiment" in determining the efficacy of each circuit shown here: analyze the output voltage (logic state) for each of the switch's two positions. This simple approach usually helps clarify what each circuit does and why the ïmproper" circuits do not work. Explain how this circuit functions. I'll let you and your classmates figure out how this circuit functions! Follow-up question #1: explain how you could use a voltmeter as a logic probe to do troubleshooting in a digital circuit. Follow-up question #2: write a formula for calculating appropriate current-limiting resistor sizes for the two LEDs in this circuit, given the value of +V and the LED forward voltage and current values. 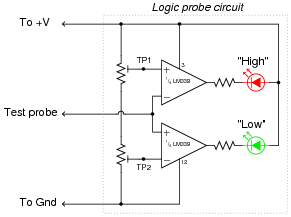 It is important for students to understand that there is a certain range of voltage between a guaranteed "high" state and a guaranteed "low" state that is indeterminate, and that this logic probe circuit is designed to indicate this range of voltage by turning neither LED on. If time permits, discuss some of the benefits and drawbacks to using a voltmeter as a logic probe (especially a digital voltmeter where the display update time may be relatively long). The purpose of this question is to get students thinking in terms of "digital" quantities, which by their very nature are non-continuous. It is important to note that the concepts of continuous and discrete quantities are not limited to electronics, but are found in a variety of places in every-day life. It should be noted that some of these determinations are subjective. The voltage output by a comparator may be considered discrete on a large time scale, but there is a measurable transition from "high" voltage to "low" voltage in which the output voltage is somewhere between full saturation limits. Two computational aids of antiquity are the abacus and the slide rule. Which of these mathematical instruments would be considered änalog" and which would be considered "digital"? Explain your answer. Slide rules are analog, while abaci (abacuses?) are digital. One challenge to answering this question is for (young) students to figure out what a slide rule is! Complete this schematic diagram by including a switch in the drawing, such that in each of its two positions, a definite "low" or "high" logic state will be sensed by the circuit's input terminal. While this may seem to be a very elementary question, it is important to get students to realize just what logic states are, in their physical representations. Too often I read textbooks and other digital logic tutorials that leap the student immediately into a boolean analysis of gate circuits, with everything operating off of abstract 0's and 1's (or "low's" and "high's"), without properly introducing the electrical nature of these states to students. Remember, your students should be quite familiar with electrical circuits, including analog transistor and op-amp circuits, by now, so beginning their study of gates from an electrical perspective should be natural for them. Only after they realize how logic states are represented by voltages do I recommend discussing gates and truth tables.